A technology for generating electricity from coal without pollution achieves a milestone. Of course every every news source I found made the fundamental assumption that CO2 emission (plant food) is actually hurting something. Plenty of readers here agree with that premise, however I don’t see any evidence for that claim. The mere fact that CO2 can alter climate, does not preclude the possibility that the climate for our existence can improve. This is beside the point though, a true zero emission technology is hard to argue against in our feelings-are-equal-to-logic world, and if it gets people moving in the right economic direction, I’m on board too. Note that the resulting process on the bottom line looks very similar to the old fashioned process of actually burning coal in a fire pit. In fact, it is exactly the same, so it leaves one wondering just what “scheme” these people have invented. This rather convoluted process has at least two advantages. It produces a pure stream of carbon dioxide that’s easy to capture and ready to be stored underground. And the burning of iron in air also takes place at lower temperatures that don’t produce nitrogen oxide. 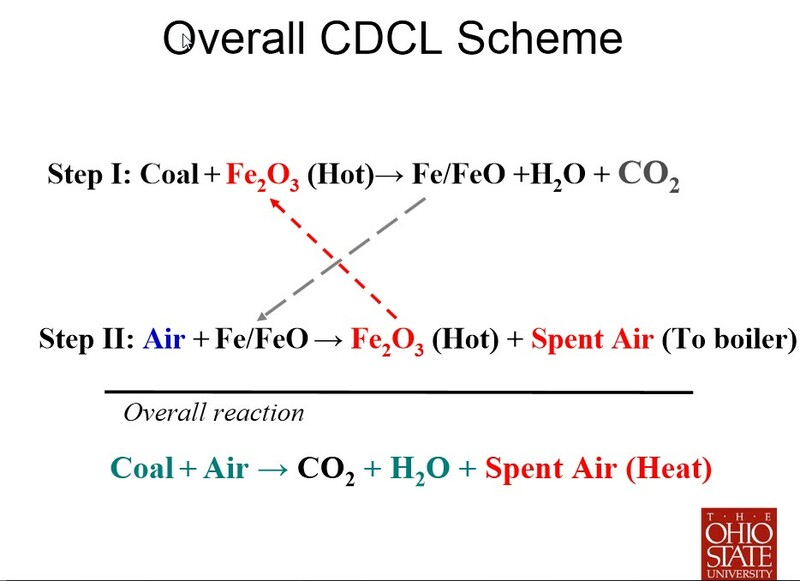 So what we have is a process which uses Iron oxide (rust) to transport oxygen to pulverized coal. The Iron is then re-rusted with air, to recycle the material and burn more coal. The process happens slower than simply pumping air through coal so the material burns slower and the scientists separate the CO2 from the water rather than dropping it all into the sky. In a nutshell, rather than some great technological leap forward, the process is a convoluted way to transport the oxygen to burning coal. I can’t find anything of revolutionary properties that cannot already be achieved with other technologies. Separating gasses from the H20 in the emission stream of a standard coal plant and compressing it into a tank, is not technologically challenging. The emission fraction of CO2 from a standard coal plant is already 99ish percent and if you are putting the Co2 gas into a tank, why not put all of it except the water into it? Other technologies already produce a more pure CO2 stream than most coal plants (if that is actually important) and do it at a high temperature more standard process. One would think this would be a near non-story but this isn’t a world where logic trumps sensationalism. There was plenty of money spent on it though. 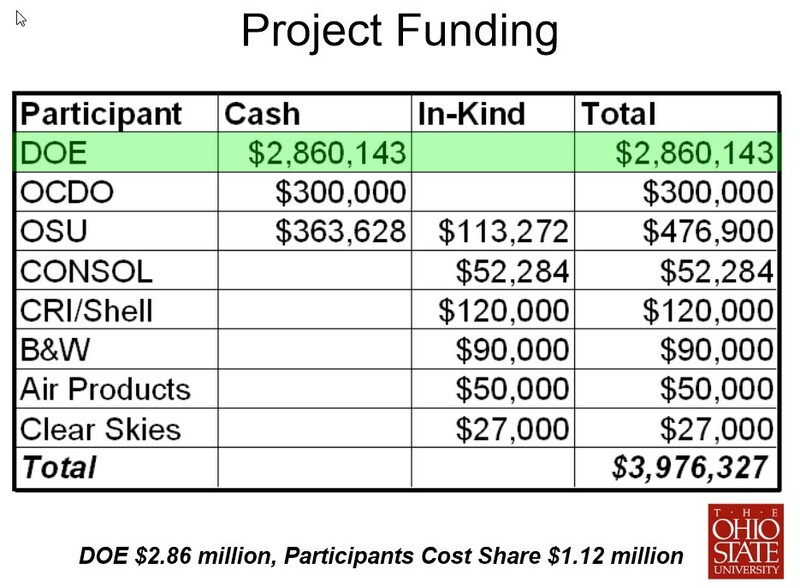 The government has invested over 3 million and coal/oil companies have invested hundreds of thousands, and both of these groups have direct knowledge that the project cannot actually be successful because it doesn’t address what to do with the carbon dioxide. Worse, the reduced efficiency to capture, grind and separate the CO2, it actually produces MORE CO2 per watt than standard coal plants. I suppose that since there aren’t any good alternatives for investing green money, they have to dump the cash somewhere. It is really too bad that the givernment is stealing it from me in huge wads first, because I could have actually done something with that cash. You would think that the project would stop there until we had a place to actually put the CO2. The scientists have shown the capability to burn stuff this way but we have nowhere to put the stupid compressed CO2 gas. That isn’t how the left thinks feels. Instead, our glorious economic superiors are “investing” confiscated money toward actually implementing powerplants with this technology. In a related advance, Illinois is actually building a carbon capture plant which uses purified oxygen, and apparently puts the CO2 into the ground where in the long run, we won’t actually know what happens to it. and climate deniers believe that temperature records have been illegitimately adjusted to exaggerate warming (e.g., Condon, 2009). Being surprised at the accusation, I pointed out in multiple emails to Dr. Lewandowsky that the Air Vent blog has published many articles using those exact records (here for instance) both on line and in peer-reviewed literature and no such claim regarding global temperature had ever been made by me. I have even created on-line global temperature results which have been compared favorably to many of the professionally funded series by others publishing global temperature series for climate science. A short chain of emails ensued where I explained in detail how my scientific positions have never supported his accusation. After a short while, with no hope of resolution, I was forced to go directly to the editor of Psychological Science, who eventually agreed to remove the citation. Humorously, the Air Vent was the single blog which made the citation list. I am not a naturally vindictive person so I took the editor at his word and let the matter rest. I have not had time to follow through as to whether the citation removal was completed, however Stephan Lewandowsky has continued to link to the unpublished original, University of Western Australia hosted, libelous document. I would link to the paper, except that his new editors were far more rational than Eric Eich, and on notification, have simply removed the paper from publication. They have additionally agreed to remove the false reference before any publication continues. Original link here. I am impressed with the quality of the Frontiers in Psychology Journal response, and hopefully Lewandowsky will now let the unfounded personal attacks rest. As Dr. Lewandowsky and his team were aware, the conspiracy claims against me regarding the adjustment of temperature records were unsupported. This is was a psychology paper of which I am at least an “alleged” subject. A misrepresented data point, like so many other bloggers, who’s identity was unethically revealed. Since I did originally take the time to inform Lewandowsky of my actual opinions on temperature records, and since he was fully aware that the article in question did not support his claims, it is my opinion that Lewandwosky and his coauthors intentionally introduced false data into a peer-reviewed paper. Ironically for a paper on conspiracy ideation based on others (read non-authors) pre-conceived bias, the authors scientifically irrational accusations were completely unnecessary to the point their paper purports to make…..
.. unless one believes in the Lewandowsky conspiracy. I have been receiving emails from the authors of the condensation driven wind theory for several days now as they have published a new paper. Since I have no time whatsoever, I haven’t even read their latest work.